Everidge partners with the leading refrigeration manufacturers in the industry to supply our customers with the best and most efficient units available on the market today. 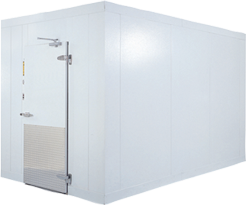 This partnership allows us to provide walk-in units that use high-quality components and are designed to meet the needs of any facility, with a variety of mounts, coils, and condensing units available. For convenience stores and high-volume commercial kitchens, our split systems are available from ½ to 6 horsepower and up to 40 horsepower for warehousing. Our energy-efficient commercial refrigeration systems in our units come complete with EC motors on all evaporator fans blower coils, and our split systems have built-in Smart Defrost energy controls. All Everidge commercial refrigeration systems come standard with a split control systems controller, a factory installed and tested control system that builds upon the reliability of the Heatcraft commercial refrigeration system controls portfolio. Using state-of-the-art refrigeration controls technologies, this controller provides reliable and stable operation while saving energy.